An ode to mothers! They have toiled, they have sacrificed, they have given more than we can ever imagine possible. Here is a special collection for Mother’s Day by Missha, a gift you can be confident she will absolutely love! Go ahead and make the most important woman in your life feel on top of the world with the Missha Time Revolution White Cure Series. With years of research and clinical testing, Missha presents its expert skin care formulae that not only nourishes, rejuvenates and revives your skin but also has anti-ageing, skin whitening, and hydrating properties all in one! Missha Time Revolution White Cure Dark Control Cream is a gel-type whitening and moisturizing cream that has been specially-made so gentle for sensitive skin and in caring for the delicate under-eye area to reduce and eliminate dark circles. Gel-Type Cream Whitens and Moisturizes Sensitive Skin. Missha Time Revolution White Cure Dark Control Cream offers a quick and long-lasting beautifully moist, flawless, and radiant complexion to young and sensitive skin with its gel-type cream formula that makes it equally suitable and safe to care for the most delicate areas of your face, i.e., the under-eye area to eliminate melanin-induced dark circles. It has a highly-concentrated and oil-free formula that quickly penetrates deep into the skin’s inner layers and leaves the skin with a brighter, whiter, softer, smoother, and a silky touch, and without the greasy nor sticky after-feel. Dermatologist-tested and developed by the leading cosmetics brand in Korea, this product has been proven to improve your skin’s condition everyday and yield significantly beautiful skin result in as short as one (1) week. 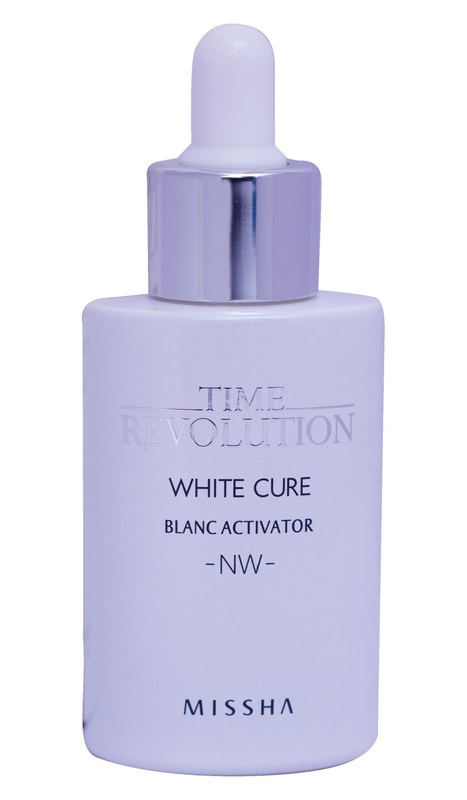 To maximize its harmonized whitening and moisturizing effects, use this product together with the other Missha Time Revolution White Cure products. What Does Missha Time Revolution White Cure Dark Control Cream Do for the Skin? Nourish skin with a rich blend of nutrients from its natural extracts, especially antioxidants, like Vitamin E, which act on the skin’s epidermis, and Vitamin C, especially from the fruit extracts of Cucumis Melo, which helps to boost collagen formation, whiten the skin, and improve the skin’s firmness and elasticity. 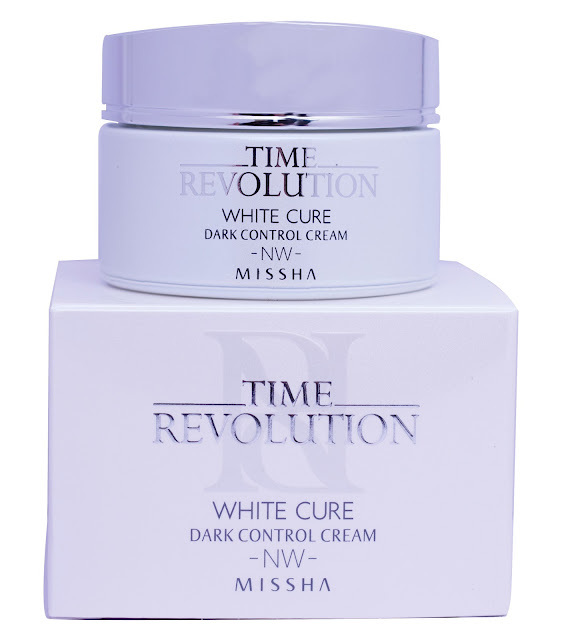 Active Ingredients in Missha Time Revolution White Cure Dark Control Cream. Protect the skin and the DNA from damage. White Flower Extracts: Comprising 20% of its formulation and consists of the extracts of Rose, Freesia, Edelweiss, Jasmine, Lily, Iris and Lotus that nourish, moisturize, whiten, rejuvenate the skin, and protect it from free radical damage. Missha Time Revolution White Cure Super Radiance Lotion soothes and helps to lock-in your skin’s moisture after toning and seals in the effectiveness of your serum as it works all day to keep skin hydrated and protected from discolorations and darkening, UV damage, and premature aging. Lightweight Milky Emulsion that Intensively Hydrates and Whitens Skin. Missha Time Revolution White Cure Radiance Lotion is a whitening emulsion that helps to keep your skin hydrated, radiant, and protected from melanin-induced skin darkening and discolorations all day long with its concentrated blend of whitening, moisturizing, nourishing, and anti-oxidizing ingredients. Nourish the skin with a rich blend of antioxidants, including Vitamin E, which strengthens its ability to defy free radical damage and premature aging. Dermatologist-tested and developed by the leading cosmetics brand in Korea, Missha Time Revolution White Cure Super Radiance Lotion visibly whitens, brightens, and improve your skin’s condition each day. This product also works best when used with other Missha Time Revolution White Cure products. Active Ingredients in Missha Time Revolution White Cure Super Radiance Lotion. 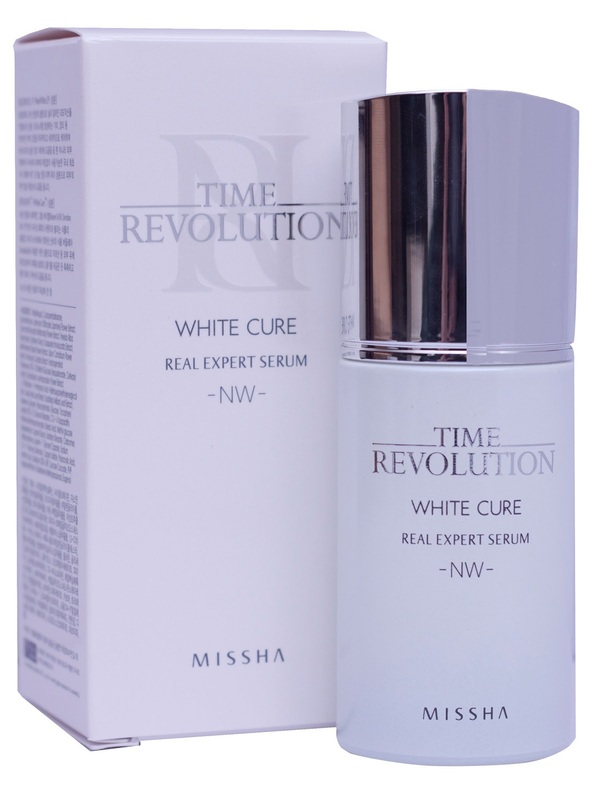 Missha Time Revolution White Cure Real Expert Serum is a highly-concentrated whitening serum that has been made so effective by the fusion of a special internal whitening technology, DNA-care agent, and the pure and natural White Flower Extracts. As such, it brightens the skin so quickly, immediately stops the development of hyperpigmentations from within the skin, protects the DNA from damage, and shields the skin from the environmental factors of skin aging. Internal Whitening Technology Quickly Stops the Development Dark Spots and Hyperpigmentations. Missha Time Revolution White Cure Expert Serum offers an intensive whitening and moisturizing solution that extends its instant and long-lasting skin-caring efficiency up to the most important component of the skin cells, i.e., the genetic material or the DNA. Strengthen your skin’s natural ability to defy dryness, darkening, and premature aging. Dermatologist-tested and developed by the leading cosmetic brand in Korea, Missha Time Revolution White Cure Expert Serum visibly whitens, brightens, hydrates, and smooths the skin in an instant. To maximize and prolong such beautiful skin result, use this facial serum together with otherMissha Time Revolution White Cure products. Active Ingredients in Missha Time Revolution White Cure Expert Serum. Strengthen the skin’s resistance against damage when exposed to urban pollution, the sun’s UV rays, cigarette smoke, and environmental toxins, among the other factors, which induce the proliferation of free radicals, or active molecules that can damage the skin cells, and which damage manifest on the skin’s surface as wrinkles, dark spots, and other signs of premature skin aging. Mela-Sponge System: Exclusively created for Missha Time Revolution White Cure Blanc Activator, it controls melanin formation, suppresses the formation of free radicals while preventing skin pigmentation and oxidization, and helps to restore the skin’s and maintain your skin’s radiance. Aquaphyline: Hydrating protein that regulates the process of epidermal hydration by stimulating the synthesis of the aquaporines, or the "plumbing system for cells," and increases the water-binding capacity of the epidermis. *White Flower Extracts: Comprising 20% of its formulation and consists of the extracts of Rose, Freesia, Edelweiss, Jasmine, Lily, Iris and Lotus that nourish, moisturize, whiten, rejuvenate the skin, and protect it from free radical damage. Missha's first step into the Indian Market was initiated through the luxury distributors ‘SUNGLASS PALACE PVT LTD’. Following soon after their US launch in New York’s 5th Avenue, Missha has spread worldwide and has now entered the flourishing Indian market. Cosmetics and skin care are no longer a luxury, in fact, they have become everyday must have items that have even stepped over the boundaries of gender. Unfortunately such everyday essentials are sold at rocket-high prices where customers no longer pay the price of the actual product however are instead found to be paying the price of extravagant packaging or mass media advertising. Although at the moment Missha is surrounded with steeply priced competitor's cosmetics; it is our mission and goal to normalize such extravagant pricing. We firmly believe that we can only accomplish this through constant support and interest from our Missha loyalists that have been steady and strong with us ever since the first day of opening. Missha will continue to achieve recognition worldwide for the quality of our cosmetic products and not by packaging. It is our sincere belief that through quality alone, Missha will be able to captivate customers' hearts forever. Missha Skin Care caters to your various skin care needs: Missha Super Aqua for pore cleansing, skin moisturizing, and acne control, and Missha Revolution series to realize your top-of-the-line skin care goals, like, whitening and anti-aging. Missha Super Aqua and Missha Revolution are both created out of the Korean and French knowledge, expertise, and skills in skin care as Able C&C Co., Ltd., the Korean company behind Missha, collaborates with the French skin care specialist, Parfex, and the world’s leading supplier of cosmetic actives, SERO Biologiques in France, to create the products that accurately understand the nature, health, and needs of everyone’s skin.